The 2012 summer has been typically British; short blasts of hot sunshine, damp around the edges and a determination on the part of the nation’s swimmers to make the very best of it. When the sun shone, swimmers were out in force across the country, thousands of them, even if most were unaware that they were ‘wild swimming’ or even of the existence of the Outdoor Swimming Society. Ever since the lido era changed the focus of swimming from the early morning to the sunny day, it takes a spell of good weather for our numbers to be revealed. Yet when it comes to our freedom to swim and the general public’s perception of swimming in the wild, there is still a long way to go. There have been hopeful signs. Progress by swimmers at Sparth and promises of a bathing beach at Rutland Water are two good examples, but, alas, two swallows don’t make a summer, and our freedom to swim lies very much in the balance. Recognition that some may wish to plunge into the Thames sparked a ban by the Port of London Authority and a backlash from the Mayor of London Boris Johnson. For my part I feel irresistibly drawn to water, and slighted when prevented from swimming in it. I feel a sense of belonging; of attachment to the aquatic environment; a sense of deep satisfaction and fulfillment as I sink in and swim, and of course swimming is such fun, it puts a smile on the face of the swimmers as well as the faces of those looking on. I remember watching a Michael Palin travelogue; his train broke down in the middle of nowhere and as it was going to be quite a wait for a rescue business men, mothers, bankers and children stripped down to their underpants and went swimming in a nearby lake. Of course, the British wouldn’t dream of leaving the train, but perhaps we would become a little less stuffy if we took off our ‘official hats’ from time to time and connected with people and with the fun of actually being alive. I revisited Blenheim Palace at the beginning of August and savored a stolen moment of sheer bliss. The majestic setting steeped in history and the beauty of the scenic panorama inevitably drew me in. Like a bright lustrous wine that can be savored on the palate for but a moment, my swim in the main lake was, alas, a singular pleasure. Much as I would have loved to swim beneath Vanbrugh’s Grand Bridge and on into the Queen Pool, two ‘concerned’ members of the Blenheim staff requested that I not go back in for fear that I might encounter fishing hooks and line. Anxiety that should I be injured, they would be liable brought an end to my discreet adventure, even if it did not sit well with the Churchill spirit. With their reasoning I did not agree, but their instantaneous appearance from nowhere, along with their pleasant good manners made it hard to be confrontational. A little earlier I had enjoyed seeing an owl swoop over the heads of wide eyed children, a mock jousting tournament and sword fight ending with a pretty girl being dragged behind a horse in a sack. Swimming in the lake seemed much less dangerous, but then you can’t be too careful can you? Well perhaps you can. If we don’t encourage sport and activity how will we inspire a generation? Alistair and Jonathan Brownlee have shown us how it’s done; now it’s up to the Nation to keep the flame alive. Across the country news reports have expressed concern about youngsters cooling off in the brief spells of sunshine. A hard hitting video produced by United Utilities has been targeting teenagers warning that it is never safe to swim in open water. In Plymouth there has been much concern about tombstoning. Participants as young as eleven are reported to be risking their lives by plunging from great heights into the sea, yet by way of contrast, the Nation has been gripped by the display of somersaults and agility as Team GB divers competed for medals at the Olympics. Divers spun with heads just missing the diving board, entertaining a worldwide audience to standing ovation. 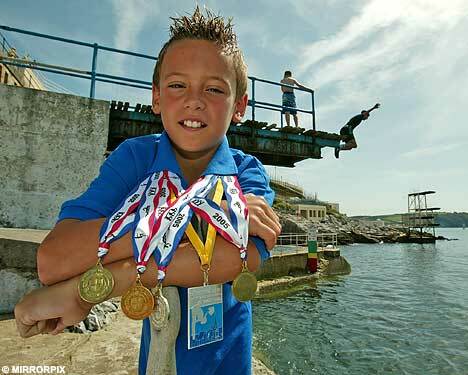 One teenagers’ desire to compete was fuelled at a young age having joined the divers on Plymouth Hoe. Not that long ago youngsters were able to jump from the seaside diving boards with a depth gauge reminding them of sea levels and safety. The British were proud to see Tom Daley receive his well deserved medal, applauding his achievement at the Aquatics Centre. Teenagers love the thrill of jumping and diving, those of us less brave are content to stand and watch and cheer them on. Perhaps it’s not the active teenagers of Plymouth who should be condemned, but rather the authoritarians that wrecked the facilities, which for me were the highlight of Plymouth Hoe, leaving the would be ‘Tom Daley’s’ little choice, other than to jump from the cliff top. Youngsters are our future, and this is especially true when it comes to wild swimming. The National Trust has listed wild swimming as one of fifty things children should do before they are 11 3/4. Even ROSPA now recommend wild swimming. Yet wisdom dictates that newcomers receive a little education if they are to do so safely. A paper in the Lancet, timed to coincide with the Olympics, compares the rates of physical activity worldwide country by country. Great Britain was highlighted as one of the least active, with those 15 years and over far less lively than those in France, Australia and despite the stereotyping, even America. According to the Lancet, insufficient activity has nearly the same effect on life expectancy as smoking! I think we should get out and grab life while we can. Let’s get active and swim our way into the future. Perhaps the weather is to blame for our British reserve, for our stiffness and self rectitude. In hot countries the beaches, pools, and rivers fill as the mercury rises. People stop worrying and just get on with the happy business of cooling down and relaxing. Does the swimmer have the right to swim? I say we do. Let’s be inspired by the 2012 Olympics, let’s get out, get active and set an example by swimming free in 2012. From Florida we hear the harrowing story of 17-year-old river swimmer Kaleb Langdale who sacrificed his arm in an alligator attack. The incident took place on Monday in the Caloosahatchee River west of Lake Okeechobee. Wildlife officers caught and killed the 10 foot predator and retrieved the arm but doctors were unable to re-attach it. Despite this the boy is said by his friends to be in good spirits. We are now at the end of the alligators mating season during which alligators become much more aggressive and inquisitive as they look for food for their mates. Humans are rarely bitten though, in fact an official stated: “We have millions of people swimming in the state’s waterways and nothing happens.” In the last 63 years there have been some 224 major incidents involving alligator bites with 22 fatal bites averaging one every three years. What a contrast we see in the attitude of officials in Florida towards wild swimming, and the health and safety obsession of the English. In London swimming in the Thames has been banned by the Port of London Authority despite the objections of Mayor of London Boris Johnson who calls it ‘elf and safety’ lunacy. In Florida swimming continues in waterways despite the risk of alligator attack. For information on open water swimming safety for children in the UK visit: Swim Safe. For teenagers visit: Swim Smart.